For instance, a pedestal sink that has graceful lines will be more elegant than a blocky cabinet vanity. The classic claw foot tub can serve the same function as a bathroom sculpture. If it is enclosed in a deck, the graceful but simple lines of the lip will retain its natural beauty that is better than most acrylic versions. Also, it is best that you keep your design simple, that is, you should avoid curves, steps, ornate decorative moldings and, unimportant details or ornamentation. If you make sure that the design of your bathroom renovation is simple, then it will be more cost-effective to fit out. When you are planning a bathroom renovation, it is best that you choose durable flooring. For instance, Marble, Stone and, Ceramic tiles are very durable options of flooring and they are also water resistant. The use of subfloor heating coils can be used to make sure that these hard surfaces are kept warm. Enclosed hardwood floors can also provide natural warmth and serve as a foil for the other cold and hard surfaces in the bathroom. If there is little space for your bathroom renovations, then you can use large mirrors to make the bathroom feel lighter and more spacious. One of the best ways is by using a large frameless mirror to cover the whole of a wall. Also, if you want to avoid misting up of these mirrors after showers and baths, use fitted heating pads behind the mirror. If you want to make sure that your bathroom has a clean look, it is best that you ensure that your plumber helps you conceal the pipe works properly. You should also ask the plumber to conceal the services in flooring, ceilings and, boxing wherever necessary. This process will also make it easier to tile and lay flooring. However, it is important to make sure that important parts of the pipe works are accessible in the event of a leak. When you are renovating your bathroom, it is important that you consider the ventilation for every design and fixtures you plan for the bathroom. It is very natural for the bathroom to be damp as a result of condensation, so it is necessary to install the proper ventilation system (like an extractor fan) to reduce the moisture. If the main aim of your bathroom renovation is to extend your bathroom space, then it is important that you know that there will be a larger area to heat. This is why it is necessary to reconsider the existing heating and upgrade the heat output if needed. When you are renovating your bathroom, it is important to always leave enough storage space to prevent clutter. Employ the use of storage furniture and baskets to keep everything out of sight. Proper lighting is an important aspect of bathroom renovation and design; however, it is important that you do not go overboard with it. For instance, you can choose to use pendant lighting (a single central fitting) which is more cost-effective and cheaper than individual downlights or wall lights. 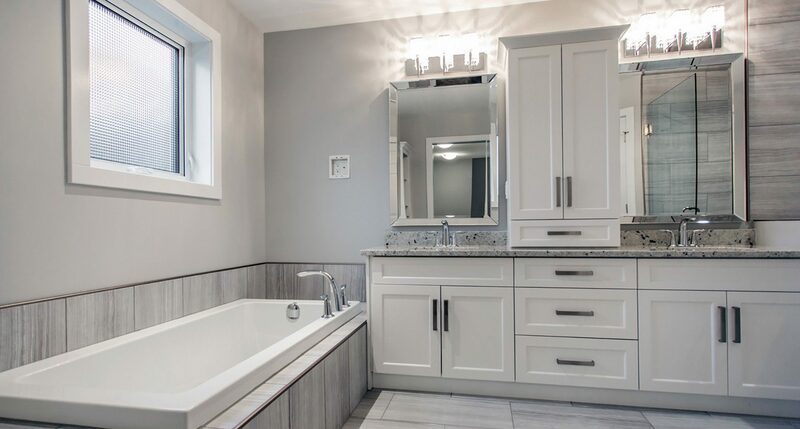 When you are renovating your bathroom, it is important that you always choose materials that are capable of withstanding the conditions of the bathroom. You can use waterproof paints, sealed wall tiles, proper bathroom flooring and materials that can withstand high volumes of water.